My business is truly a home/family business. I do most of the work, but I wouldn't be able to do it without the support of my family. First off is my husband, who supports my desire to be at home while the boy is still young. All three of the kids come to shows and markets with me - but usually one at a time. There's only so much you can fit in a Honda Fit! The boy maintains my inventory on the computer and helps with stuff like sewing buttons, and all three of them have done some photo modeling for me. 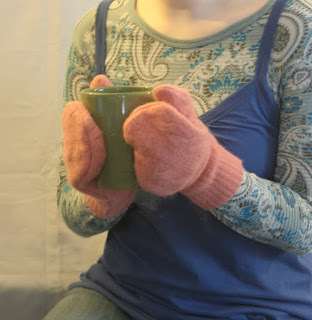 This is my oldest, modeling the mittens I make from recycled sweaters. Yesterday I had my photo "studio" set up here in the office, and she had the day off from work, so I asked if she could do a little modeling for me. I'm grateful for the help they all give me! So nice when you can have the older "kids" around to relive the good times, isn't it. 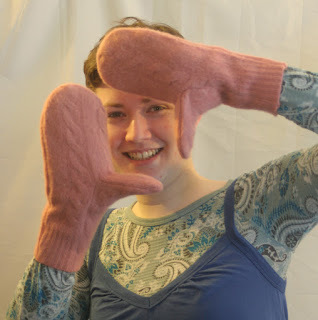 Love the mittens. In fact, I am coveting the blue ones that your daughter gave to my Sarah. If North Adams weren't so cold, they might not make it back with her! Hi! It's nice to hear from you! Anna's been telling me about your blog, and now I have the link and can follow you. Looks like fun!